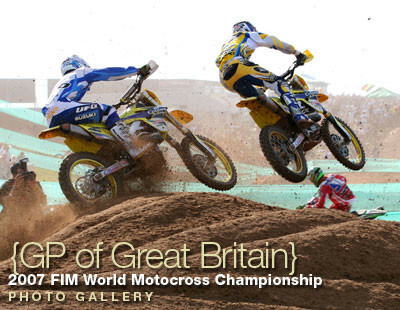 Click the following link for a 48-photo gallery of motocross race action from the FIM Grand Prix of Great Britain. You can also click the following link for a 38-photo gallery from Saturday's pre-race action in the pits, as well as timed qualifying. With one World Motocross title already decided (Antonio Cairoli clinching the MX2 crown), another to be settled next weekend in The Netherlands (between Josh Coppins and Steve Ramon), as well as the Motocross of Nations fast approaching, you're up to date with what's happening in Europe, right? If not, these galleries (see the links above) shot by Jeffrey Beerdsen will get you up to speed on the happenings across the pond.